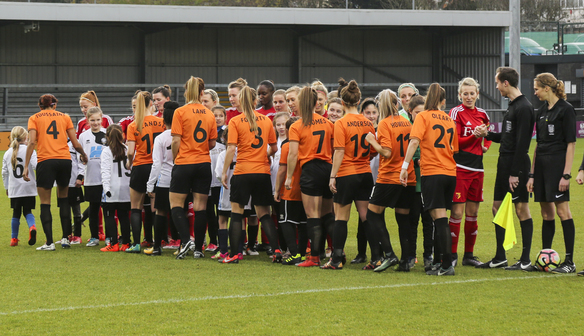 The London Bees Football Education Programme will train at The Hive Football and Fitness Centre, which is situated in Edgware, Middlesex. The facility is also the training facility of London Bees, Barnet FC’s First Team and Academy. Provide an outstanding football education model with identity, and every player has a personal plan, which helps them towards becoming the best they possibly can be with a desired aim to be an elite player and develop skills for lifelong learning. Our mission is to discover and develop the potential within each player through engagement in their technical, tactical, physical, mental, academic and overall holistic development. 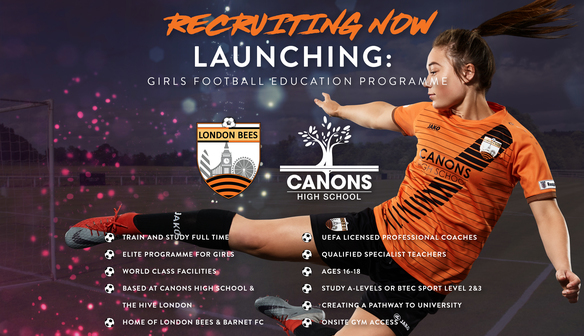 To progress the London Bees Player Development Pathway and introduce education for players and learners ages 16-19. To Provide training and facilities for female players to develop their footballing ability for ages 16-19. The foundation stone of the high achievement of children at Canons High School is the fact that we get things right in supporting staff and families to support students. We know the importance of setting tough challenges whilst holding caring expectations for all who join our school and achieve this through knowing them well as individuals, both pastorally and academically. There are simple and clear rules for behaviour in classrooms and around the school that all staff use with great consistency. Our incredibly strong pastoral system, including a five-strong Behaviour Support Team, ensures that teaching and learning can take place unhindered whilst also tackling the root causes of underachievement. Coupled with this, our reward system ensures that students are regularly caught ‘doing things right’ in terms of both behaviour and academic progress. BSc(Hons) in Sport and Exercise Psychology. Sports Coach, Sports Development Officer, PE Teacher, Sports Management, Physiotherapist, Scouting, Personal Trainer, Psychologist, Strength & Conditioning Coach, Sports Media. Training sessions are facilitated by professional UEFA licenced coaches provided by London Bees coaching staff. Supporting the individual to achieve their career aspirations within sport and football while developing their football skill. All learners will be tested on their academic ability and provision offered for development of English & Maths. Email: lswindlehurst@londonbeeswsl.com to register your interest.